Have you seen a drip cake lately? If you have watched any food shows on TV or have gone past a trendy bakery chances are you have seen one. They are super popular right now and with good reason. 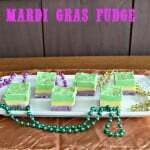 They are fairly easy to make but they look really great. You can customize them using whatever colors you want. Since Valentine’s Day is right around the corner I decided that I needed to make a themed drip cake. We got a ton of snow the other weekend so I knew we weren’t going to be able to go anywhere and I planned on making my cake while J was napping. I gathered everything I needed while he was still awake so I would be ready to go once I put him down. As it turned out I ended up making and baking the cakes while he was up. He wanted to be picked up so instead of just walking around I decided to make the cake. They came out looking gorgeous and the first one popped right out of the pan. Unfortunately the second one had a crack in it and when I went to put it on the cooling rack it ripped. I’m usually not too emotional about baking but as I tried to get it back together and it just kept getting worse I ended up in tears. 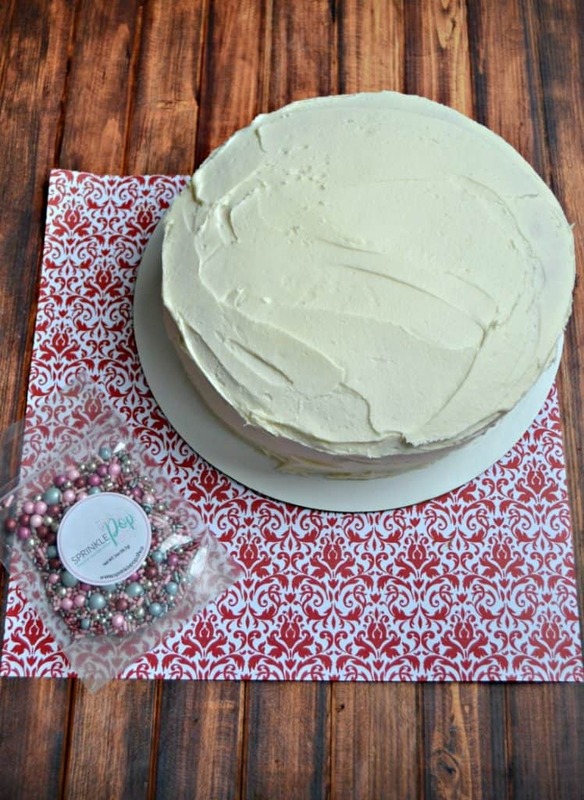 I couldn’t believe I was that upset but I had been feeling really good that all I would need to do once I put J down was frost the cake but it wasn’t meant to be. I quickly whipped up another cake along with a batch of buttercream frosting. Once the cakes were cooled I put frosting on one layer and topped it with the second layer. Then I spread the buttercream all over the cake. 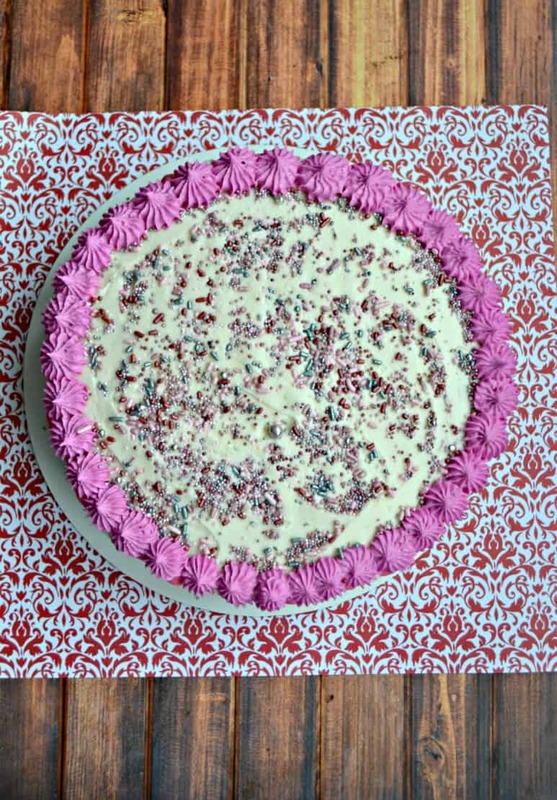 I took the gorgeous Romance Sprinkle Mix from Sprinkle Pop and put it around the bottom inch of the cake instead of making a frosting boarder. I love the muted and romantic colors in this mix. They scream love. Then I had to whip up the chocolate for the drips. Now I had never made a drip cake before so I was a little nervous about this. 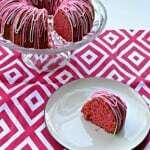 I used pink candy melts and added a touch of coconut oil to the mixture to thin it out so it would drip down the cake. Using a squirt bottle I put the candy around the cake and allowed it to drip over the edges. Once I was happy I moved on to frosting the top edges. Since I wasn’t putting the candy mixture all over the top of the cake it was important to pipe a border around the top edge. I used pink and purple coloring and got a pretty dusty rose color that I piped around the edge. It covers up the uneven candy mixture on the top and really makes the cake look pretty. Then I sprinkled a bit more of the Romance Sprinkle Mixture around the top and I was finished. The resulting cake was beautiful. It really was! The colors were romantic and sparkled. The frosting color was perfect for Valentine’s Day. The drips even looked great. When I cut the cake open and found the frosting layer to be thick and even I knew I had a winning cake! 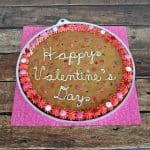 It was light and tasted of vanilla and would be an awesome way to celebrate Valentine’s Day. A delicious vanilla cake topped with vanilla frosting, bright pink candy drips, and gorgeous sprinkles. Line two 8 inch cake pans with parchment paper on the bottom. Spray the parchment and the sides of the pan. Add in the eggs and mix well. Stir in the vanilla. Add in half the flour, the baking powder, and the salt. Mix well. Add the remaining flour and mix until batter is smooth. Divide the batter between the two prepared pans. Bake for 30-35 minutes or until a toothpick inserted into the center comes out clean. Allow to cool for 10 minutes then run a butter knife around the edges of the pan. Remove the cakes from the pans and place on a wire rack to cool completely. To make the frosting place the butter in a large bowl. Beat with a mixer until smooth. Add in the powdered sugar one cup at a time, beating after each addition, until well combined. Stir in the vanilla. 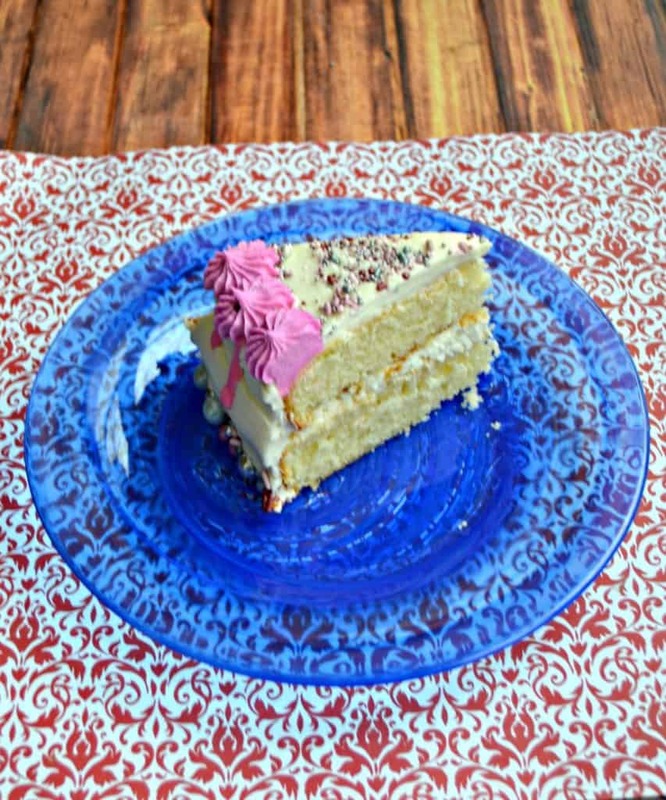 Place one of the cake layers on a cake board. Place 1 cup of frosting on top of it and spread it out. Place the other layer on top of the first layer. 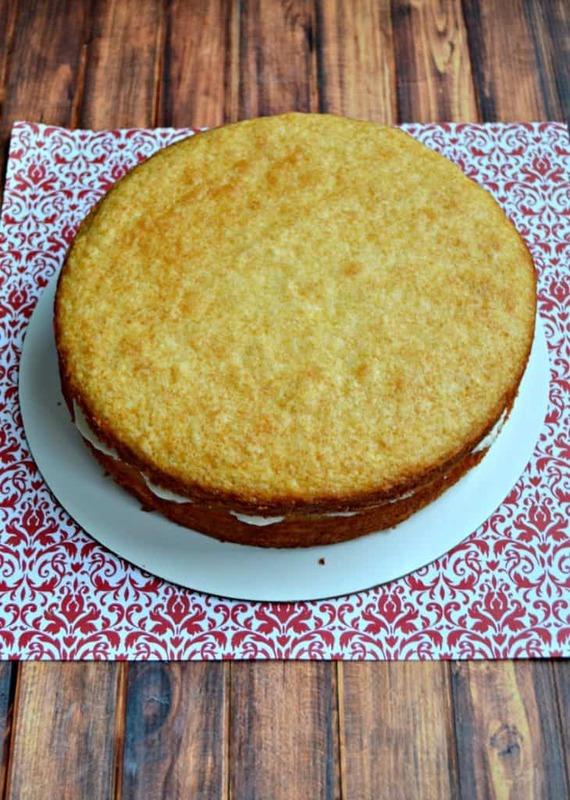 Place several cups of frosting on top of the cake and frost the top and sides. 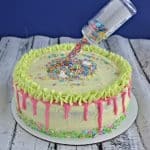 Carefully press sprinkles into the bottom one inch of the cake. To make the drip place the candy melts in a microwave safe bowl and heat for 30 seconds. Stir and add in the coconut oil. Continue heating in 20 second intervals, stirring after each heating, until smooth. Allow the mixture to cool for several minutes or until it is just beginning to thicken. Pour mixture into a squirt bottle. Begin squirting a small amount of pink candy melts around the top edge of the cake allowing some to drip down the sides. Continue around the entire cake. 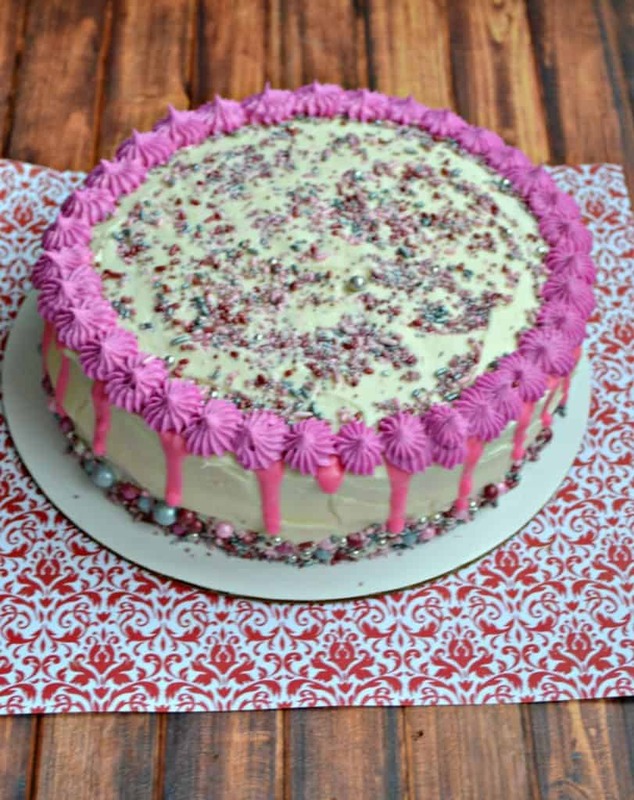 Put 5 drops of pink coloring and 2 drops of purple in the remaining frosting and mix well. Pipe the frosting around the top edge of the cake making sure to cover up the mess the candy melts made on top of the cake. Pour remaining sprinkles on top of the cake. This is such a pretty cake! I bet it tastes good too! Alls well that ends well! Your cake is gorgeous and I’m so happy you’re happy with it.